Last Thursday our very own ‘Rebel Priest’, the Rev Dr Jules Gomes, delivered the keynote speech on behalf of the George Bell Group at Church House. It was an impassioned plea for justice for the still-impugned Bishop Bell. But more than that, it was a plea for bridge-building with a Church of England that has entrapped itself in the morally relative world of victim politics and orthodoxies. This, Jules argued, citing biblical, philosophical and legal sources, has been at the expense of truth, right and justice. ‘Right’, not the modern ‘rights’ culture, must guide the Church and Christian faith. You can listen to his full address here. An edited version is posted below. The human compulsion to build bridges is deep-rooted; it is archetypal. Jacob in Genesis dreams of a ladder bridging earth to heaven. This archetypal story is immortalised by William Blake’s painting and by Francis Thompson’s poem situating Jacob’s ladder in London. Paradoxically, bridge building is fiercely contested. The compulsion to blow up bridges is also deep-rooted in human nature. 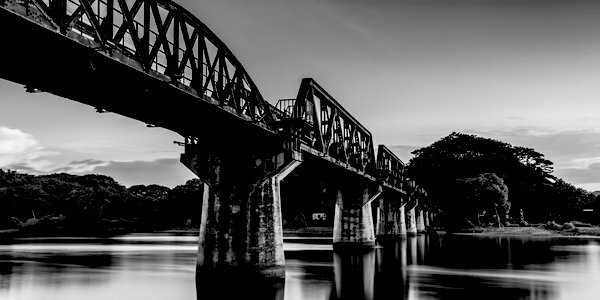 The monumental clash between these conflicting compulsions is what makes Sir David Lean’s World War II movie The Bridge on the River Kwai one of most gripping of the 20th century. To build, or not to build, that is the question we are posing at the George Bell Rebuilding Bridges Conference. Order and chaos are the constituent elements of this world. According to Jordan Peterson, ‘Order is where the people around you act according to well-understood social norms, and remain predictable and cooperative. It’s the world of social structure, explored territory, and familiarity.’ If the hierarchy of the Church of England had conducted its investigation into Bishop Bell on the principles of order, we would not be battling to clear the slander against his reputation. We are here because order has been overwhelmed by chaos. The opening verses of the Bible present us with the picture of an ocean of chaos. The Hebrew text paints for us pictures of mythological sea monsters of chaos intent on devouring God’s creation. God subdues and defeats the monsters of chaos through the logos, God’s Word. Chaos is also marked by ‘darkness over the face of the deep’. God’s first act is to dispel darkness by creating light. Light is God’s first bridge-building act. Over the last two years, the Bishop Bell group has been fighting this battle between chaos and logos. Finally, logos has triumphed. Hundreds of thousands of words written and spoken by dozens of historians, lawyers, clergy, columnists, churchgoers and choristers have prevailed. The Lord Carlile Review, a leading manifestation of ‘order’, even though restricted in its brief, has found a subtle way to pronounce Bishop Bell ‘not guilty’. But the bridge over troubled waters is yet to be built. Justin Welby doubts the logos and rejects the light and clarity of order. He returns to the darkness and disorder of chaos in his insistence that a ‘significant cloud’ still hangs over Bishop Bell’s character. Thus we may not be able to build this bridge with Welby, even though we are desirous of so doing. Our chief task, then, is to build the bridge between present and past. We build our most strategic bridge with history. History held Bishop Bell in the highest honour. The present zeitgeist blew the bridge of historical record to smithereens. It adopted a scorched earth policy and obliterated Bell’s name from institutions that had sought to etch his memory in stone. Structurally speaking, the most important part of a bridge is the beams that support it. Our bridge with history should be built on the twin beams of truth and justice. The torrential waters of the River Chaos threaten both beams. In its handling of the Bell enquiry, the Church of England has revealed its first postmodern and post-truth archbishop for whom there is no truth, only interpretations, for whom the only virtue is openness, and for whom personal experiences are more influential than objective facts in shaping public opinion. The second beam that will support our bridge across the River Chaos is justice. The philosopher Alasdair MacIntyre in his book Whose Justice? Which Rationality? speaks of ‘different and incompatible conceptions of justice’ and of ‘conflicting conceptions of justice’. Is this what is being played out in the drama of Bishop Bell? There is one school that defines justice as that which is ‘right’, and another that defines justice as ‘rights’. ‘Rights’ are the obligations society is said to have towards certain social groups and it is the status of a person in the organised hierarchy of such groups that decides what is ‘right’ according to the ‘rights’ accorded to that group. In other words, justice is now re-defined as the ‘rights’ of a victim; these rights may even trump what is ‘right’, because postmodernism defines all claims to ‘truth’ and what is ‘right’ as claims to ‘power’. In this radical re-conceptualisation of justice, those who claim to have suffered qualify by default for privileged status. They are right because they have the right to be right irrespective of what is objectively right. This, of course, is not to dismiss Bishop Bell’s accuser ‘Carol’ and her claims, it is simply to argue that the Church of England has moved considerably in its conception of justice. It is a very different conception from those who conceive of justice as ‘right’ because it is part of the right order of the logos and its features are truth and light. The problem with grounding this beam of justice so as to build our bridge is that it is constantly threatened by chaos. In his Republic, Plato seems to think that people are pushed into the path of justice only by coercion and force of law. People choose to act in their own interest given the opportunity to commit injustice, because that is what nature deems good. Of course, Plato ultimately argues that humans submit freely to justice and law because there are rewards for those who restrain themselves in the face of temptation and make amends in the case of transgression. But making amends requires great courage and it is ‘courage’ which Aristotle called the greatest of all virtues, because without courage it is impossible to practise any of the virtues. It is courage which will drive the building of our bridge across the River Chaos. Will Archbishop Welby have that courage? This entry was posted in 'Rebuilding Bridges' Morning Conference - Church House Westminster, Bishop George Bell and tagged "The Bridge on the River Chaos", "The Bridge on the River Kwai", Archbishop of Canterbury Justin Welby, Aristotle and Courage, Conservative Woman, Francis Thompson, George Bell Bishop of Chichester, Lord Carlile, Plato's Republic, Rebel Priest, Revd Dr Jules Gomes, Sir David Lean, William Blake on February 4, 2018 by richardwsymonds37.